Right now pretty and soft sweaters in pink are my favourite way to add some colour to my outfits. I keep it pale and slightly muddy in hue to fit more with the cooler weather and at the moment these tones are my favourite to otherwise monochrome wardrobe and this particular combination is a fave of mine right now. 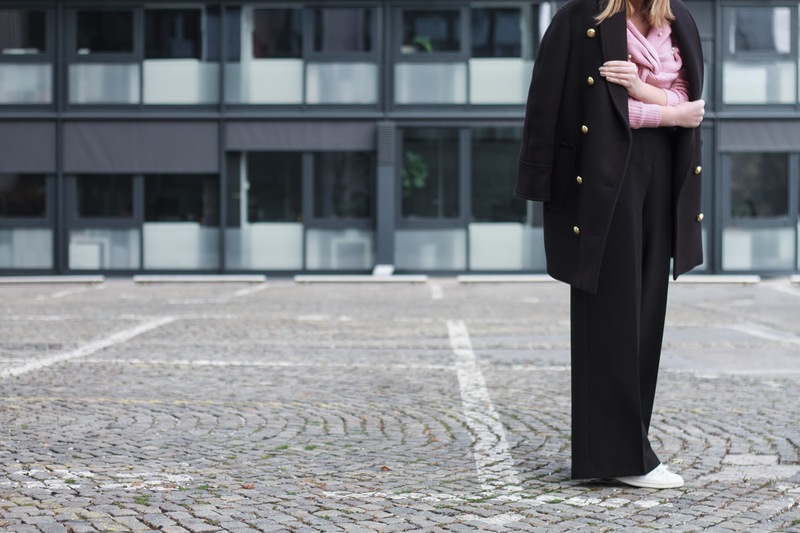 I played with different shapes and styles; feminine pants, an oversized coat and sporty trainers. This sweater from Zaful is really something special. The twist and pearls are amazing. This jumper instantly makes even the most simple outfit look amazing and I love that I don't need to put a whole lot of effort in it. And because I'm kind, I will give it away to my lovely sister who I know will like it very much. I can't wait to see it on her and what combinations she will come up with because her style is slightly different from mine.